April 9 was Easter Sunday of the 1950 Holy Year during the papacy of Pius XII. This Agnus Dei is from 1950. Father Kunst purchased it primarily because of the case it is in. It is a silver stand that says, Rome, Easter, 1950 Holy Year. Paques. The container is what makes it a particularly desirable artifact for the Collection. The Agnus Dei (Lamb of God) wax disks were cylinders or small disks of wax that were made by melting the previous year’s Easter candles of Rome’s churches. This took place at the beginning of Lent each year. The wax was melted in a large cauldron to which chrism oil was then added. 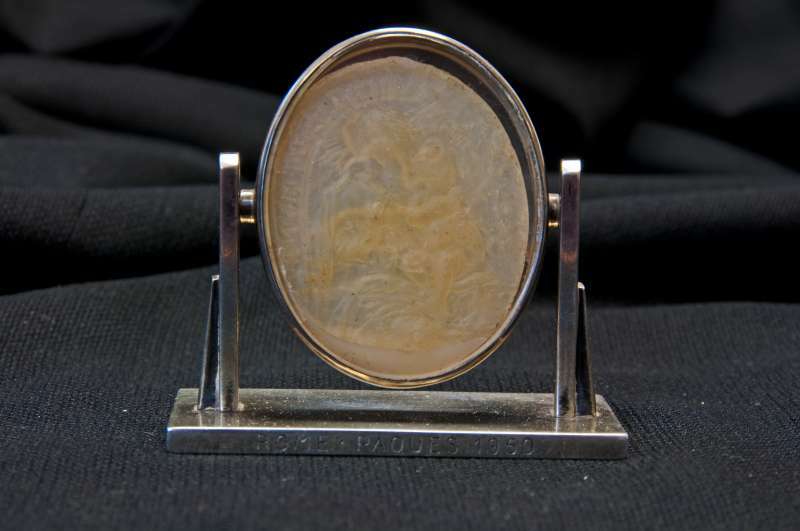 From that wax, small disks were created with a picture of the Lamb of God on them. Sometimes a saint was put on the other side of the disk. The pope’s name and sometimes his coat of arms were included as well as the year. The pope blessed the wax disks and they were given as sacramentals to pilgrims to Rome. Pilgrims experienced a connection to the paschal candle, to the chrism oil and to the pope himself.